I don’t really know too many people who keep to their new years resolutions that well. I know for one when I do I always make it a few days and fail miserably. Get sad about it and then go screw it. So this isn’t a here are my new years resolutions post. It’s my new year plans, dreams and aspirations. Someplace I can come back to and think am I keeping on track at all? You can skip to the last line of the post here if you’d like. 1: I’d like to blog more. Blogging takes time though. I could say I’d like to do one post a day for the year but what type of quality would they be of? I’ve already been trying to do a daily post with some limited success but we fall back into old habits of ug I’ve not done one for a few days so why bother. In December I took steps towards solving that somewhat. I merged my blogs into one. This one. I used have a work site, a personal site, another personal site a food site and so on… you get the idea. They’ve kinda lain dormant though so having just the one place to post should be good. 2: I’d like to fall in love with work again. I’m rather passionate about what I do (At least I’d like to think I am.) I like having a random idea and putting it into play quickly. I’m not sure why but I’ve suffered to stay in that happy place where I wake up going woo hoo a brand new day what am I going to work on today. Maybe it’s all related to life in general. It’s something I plan on trying to address more. 4: I’m going to improve my French. I’ve already taken steps this year and have started doing a course in the university. You’d think after what 3+? years in France my French would be better wouldn’t you, however working from a home office with Irish people doesn’t really help with that. So I’m going to continue on with the French classes and make attempts to write more in French. 5: Make more friends. You know when you reach a certain point in your life and you’re kinda stuck with the same group of friends and it rarely changes? I’d like to try changing that some more for the better this year. The age old oh you should join a club or do this or that is the common suggestion people make. Add in busy schedules and it’s not always that easy. 2 nights a week gone on French Class. Minding Charlotte another night or two and suddenly there isn’t a lot of time for going making “football” friends! 6: Take better photos. I guess this goes without saying for me. I love taking photos. Sometimes a completely crappy photo will make me happy. I’d like to reduce the crappy photos get more manual and get more used to using flash for photography ( that probably means I need to buy a flash right … *sighs*. 7: Cut out the crap from my diet. It’s a vicious circle in my life. I drink coffee to wake up. I drink coffee to excess. I grab a beer in the evenings to chill out and relax. Repeat. Throw in some nibbles of some sort and hey presto it’s pretty bad for you. While it’s doubtful I’ll be able to cut everything out ( and well why would I want to ) I plan to try improving things. 8: Learn more. I love learning. I’m constantly learning. In the last year I started using illustrator more. Playing with video in the form of After Effects and Premier and a whole pile of other applications. While I’d love to get modeling stuff in 3D I have to realise I just don’t have the time anymore. There are only so many hours in the day. So to sum up … I’m going to be better this year. Spend more time with my little family. Happy 2014! I ended up picking up the Lego City Advent Calendar this year. Why? cus I wanted to, also it was going rather cheap in SuperU compared to the online prices of various places. I’ve opened them with Charlotte most mornings though with being gone a week back to Ireland we may have opened a few more before I left. I’ve avoided posting a daily picture of each item. Some have been better than others. Val would have preferred if they were all Christmas themed items. I’m happy they aren’t as there’s more potential for reuse and photo ops. Today’s present is the above. 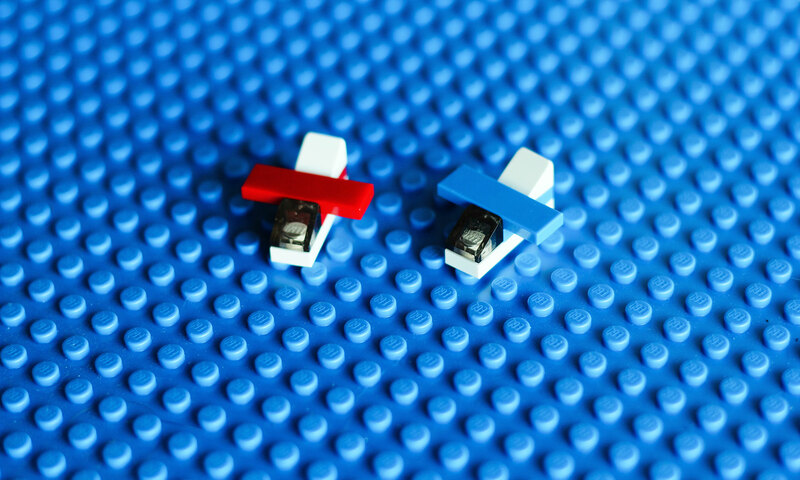 Wonderfully simple items each made from 5 little bricks and I simply find them so cool. I’m also reminding of the below advert which is extremely clever and puts the 5 bricks to shame opting for 2 to do the same job. 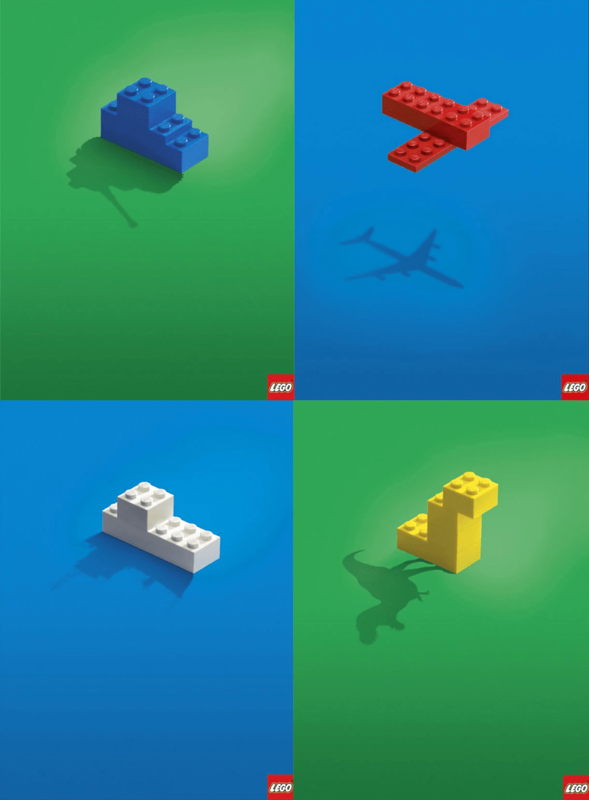 It’s lego – unleash your imagination. 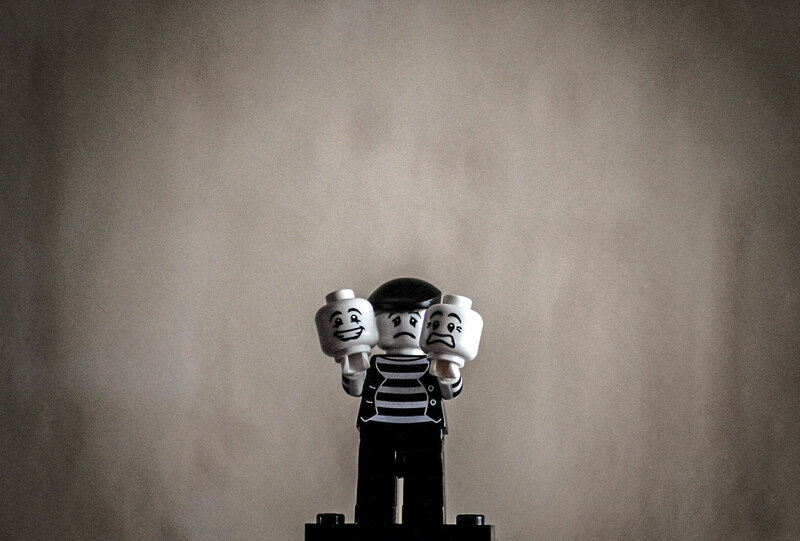 I took this lego photo a while back and it strikes a cord with me every time I see it. 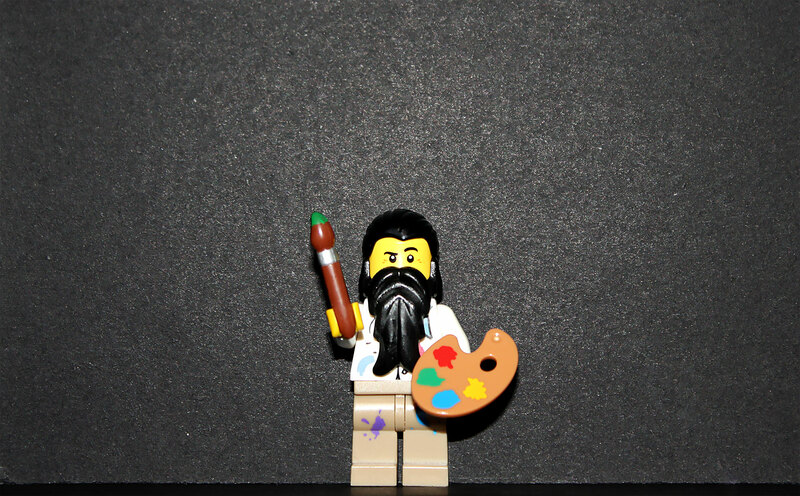 Yes I know it’s just some little minifig but it’s always got that more serious edge to it as well. What face are you going to display to the world today? Personally I’ve been feeling a bit fed up and unmotivated not to mention tired don’t think the grey weather helps. November has been a rough month! Still it’s December now and I’m trying to get into a more positive place. A friend a few days ago posted a rather raw account of something major that had happened in his life a while back and I just thought wow I never realised this. What face do you show the world and how do you really feel? I managed to get out at the weekend to take a few shots around the place. Apart from taking one selfie which I actually quite like I ended up taking this shot which I really love. While not shot in RAW I ended up using the photoshop raw filter in post processing and I really do love it. 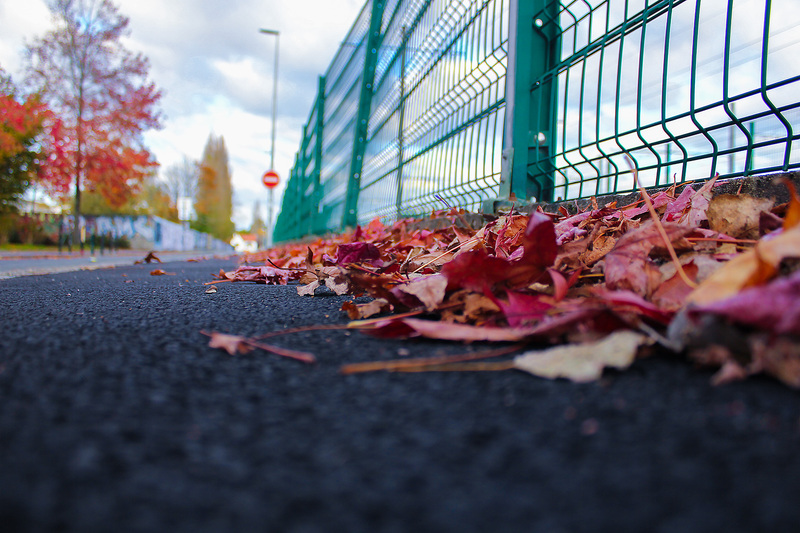 Sure you get some weird looks as you set your camera up on the ground but I do love the look. I’m guessing there’s about 1 to two weeks of the autumn leaves on the trees left. Here’s a shot I took last week of the sun setting over Nantes that has proven to be rather popular at least in terms of Likes on FB :) You can make out the Tour de Bretagne in the distance just to the right of the tall pylon. Played with the settings a small bit and dropped the ISO to get this shot and I’m rather happy with it. Some day I’ll know exactly what all the manual settings do for now though lots of experimentation. It is about you it is about .me :) Enter your firstname / lastname and hey presto it’ll check if your .Me name is available. I always love working on new projects and this one is obviously my new baby :). I especially love working on this as I think the .Me extension is one that has a genuine chance in the new “TLD”s cus hell it’s about ME!!!. I’ve got forbairt.me where I keep my lifestream obviously not my name I’ve also got jameslarkin.me which I’ll probably use for something though might just stick with my username for now. Of course one of the cool things I’ve also gotten to work on as a result was getting some USB keys made up. Blacknight asked on their twitter account and on facebook what people thought was a good minimum storage capacity for USB keys .. mixed responses mainly however from 2GBs up. And what arrived today my Get Personal With .ME 4GB USB key :) it’s very cool if I do say so myself. Of course I’m biased but to be honest I generally don’t get to see too much print work (I don’t really work with print that often and could probably count on a few hands the amount of jobs I’ve had professionally printed). Anyways the USB key arrived today and I passed it over to IT support to get it up and running and this is the result. Like a lot of people these days photography, is a hobby of mine. The age of the digital camera lets us snap away to our hearts content. A year and a half ago though I made a jump from a simple point and shoot camera up to a Bridge Camera. It was a slightly late birthday present for myself. I went and picked up the FZ28 … I did the usual research online hummed and hawed over this camera and that camera … over a proper DSLR or just another point and click type camera. I hadn’t actually tried out the Panasonic DMCFZ28 Digital Camera beforehand so when it did arrive it was a bit of a shock at how small it was. I had assumed it’d be of a similar size to normal DSLR’s I quickly got over that as I started to get snap happy with it. So for me what makes it so special? The lack of all these extras (huge camera bag with 3 extra lenses a tripod and god knows what else). This is really great for travelling. Most people I know with DSLR’s end up bringing another 2 lenses / backpack and so on with them. Thats just not for me. Priced at around the €340 mark if I had to buy one again I probably would. Though I’d more than likely look at the updated model the Irish / UK Model – Panasonic Lumix DMC-FZ38 . US Model – Panasonic Lumix DMC-FZ35 . 12 MegaPixel and various other updated features as well as being at a lower price range the €300 / $300 mark. And there I’ll leave you … my experiences with my little bridge camera have been amazing. Its a great little bit of equipment. I picked up a spare battery and I can basically leave the charger at home when I’m on holidays. All in All 10/10 for this camera. Irish / UK Model – Panasonic Lumix DMC-FZ38 . US Model – Panasonic Lumix DMC-FZ35 . Its my birthday its my birthday !!! oh wait no its not Its my nephews birthday and he’s a big 1 today. He’s my godson and its times like this that make me homesick. I’ve lost a client … well no not lost a client … the Galway City Council put the St. Patricks Galway website out for tender and well Impact Media came in and got the contract. They are a large marketing / media company based in Oranmore I believe where I’m from so not surprising for an event such as the Paddys day festival to choose them. It stings a bit losing it but it has been a fun few years being involved with it … making updates … finding out beforehand things that were going to be happening and hanging out with some of the great visitors but such is life. Here is last years St. Patrick’s Galway logo I designed. It altered only slightly from the original one I created. It was used in hoodies / branding and so on (its always nice as a mostly webdesign / online graphics guy to see your work in print) ah well best of luck to the Festival and its Organisers. ( I met my best french friend and witness at my civil ceremony Maiwenn during one of the festivals when they were over as part of the twinning for Galway Lorient. In other news I launched this blog :) and so far the comments have been positive which I’m very happy about. I’ve launched Devine Building as well. I’ve also been working on various graphics for blacknight which you can see over on blog.blacknight.com. Its based on a design they had in a Sunday paper. On top of this Dropped.ie got some new Semantic domain searchy goodness which was fun to do and implement. My camera is back up and running with its new charger and hence you’re probably seeing so many pictures on this blog that I’ve taken.